Seriously…I’m exhausted. I’ve spent the last week shopping, prepping, and last night NOT SLEEPING. We’d love to say that our sweet one year old was as excited about Christmas as we were, but she was just up. At 12, at 2, maybe 3 and 4..but definitely at 7am. But I’m not complaining, way too tired for that. To get to the point, I wanted something fast and easy for breakfast this morning. Mostly because I wanted to spend as much time with my 12 yr old before she did the ol’ Christmas Dash with her Dad. Yep..we’re a nuclear family. Now I will point out that we LOVE Pillsbury Cinnamon rolls, but I forgot to pick them up. But lucky for me, I had my pantry stocked with sugar and spice..and of course Crescent rolls. So I decided to create something quick and easy! I preheated the oven to 375 degrees and then on a cookie sheet I rolled out and separated the crescent roll dough, just like the directions on the package. But before I roll them up I smeared them with a mixture of cinnamon, sugar and softened butter. THE REAL STUFF. I literally mixed the ingredients in a measuring cup. Spread it out on the dough, and rolled them up. Baked them for about 12 mins until the rolls were brown. For the drizzle I reused my measuring cup and melted a tablespoon of butter, enough confectioner’s sugar (maybe a 1/4 cup or so) and a half a cap or so of vanilla extract. I mixed this intentionally in the cup so I could pour it out onto the warm rolls. And there you have it! 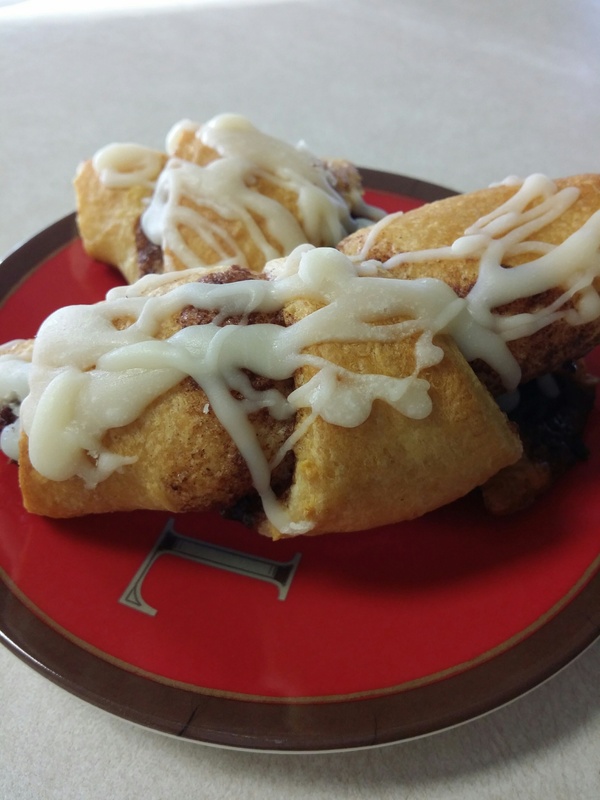 Christmas Crescent Cinnamon Rolls. Fast, easy, and delicious. Simple enough for the sleep deprived Mom..and I score points for faking like I made something homemade. Thanks for visiting with me today and Merry Christmas from My Tennessee Kitchen!